During the early 1940s, women occupied a marginal—if not non-existent—role in production at the National Film Board of Canada. At the time, the NFB was primarily engaged in producing propaganda films to counter Nazi ideology, and educational titles designed to interpret Canada to Canadians. Founded by government decree in 1939, the NFB was first headed by Scottish producer John Grierson. At the time of its founding, there were no women on staff. However, as the Second World War intensified, and as Grierson was faced with the prospect of a long conflict and large numbers of male employees leaving for the European front, he brought women into the Film Board. In a 1968 interview he gave to the CBC, Grierson stated that women made up “the other half” of the NFB’s creative workforce during the War. While it is certainly true that women were a creative force at the Film Board, they certainly were not half the staff. At most, they made up 20 percent of the production team—and very few played key creative roles such as cinematographer, director or producer. This situation, of course, was not unique to the NFB. It reflected the position of women in Canadian society at that time. With very few exceptions, positions that carried authority, influence, and high levels of compensation were reserved for men. Despite these obstacles, a few women did succeed in attaining key positions within the organization. Our special programming celebrating International Women’s Day on March 8 seems to me to be an ideal opportunity to pay homage to these pioneers. Judith Crawley was hired as a freelancer by John Grierson. She directed Four New Apple Dishes (1940), the first NFB film directed by a woman—and the first Canadian film to be made in colour. Crawley had previous experience behind the camera and as a director, having worked at her own company, Crawley Films, which she and her husband Budge Crawley had founded a year earlier. Crawley was a true pioneer of Canadian film, and is recognized as Canada’s first female filmmaker. 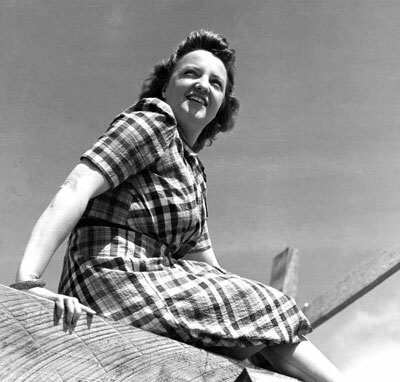 She served as a screenwriter, director, cinematographer, editor, and freelancer at the NFB from 1941 to 1944. Crawley won many awards, and her work has been widely recognized both in Canada and abroad. Her contributions to advancing the role of women in film were significant, paving the way for many of those who would follow. Crawley worked as a cinematographer on numerous films directed by the NFB’s first female filmmakers, and these collaborations helped contribute to the success of these women in a work environment that did not always take their contributions seriously. In 1941, Grierson turned to another freelancer—American filmmaker Laura Boulton—to make a series of films on Canadian cultural communities. The series was called Peoples of Canada, and its goal was to broaden awareness of Canada’s cultural mosaic, in order to create a feeling of national unity. Boulton held degrees in music and anthropology, and had a passion for world music. She had previously spent several years traveling, during which she documented the musical traditions of various African peoples, and collected samples of their music. When she arrived at the NFB, Boulton had a six-week contract to make one film. She wound up staying three years and directing dozens of ethnographic documentaries shot throughout Canada – including three films about the Inuit, set on Baffin Island: Eskimo Arts and Crafts (1943), Eskimo Summer (1944) and Arctic Hunters (1944). Because Boulton had little experience shooting films—something which did not set her apart from the vast majority of new NFB employees—she collaborated with a number of experienced cinematographers, including Judith Crawley. Robert Flaherty, the renowned director of Nanook of the North (1922), served as a consultant on Boulton’s three Baffin Island films. After the war, Boulton’s work would meet with great acclaim in Canada, the United States and Europe, contributing significantly to the growth of the NFB’s international reputation. While Judith Crawley and Laura Boulton came to the NFB as freelancers, Gudrun Bjerring Parker was hired as a permanent employee. Parker had worked as a journalist with the Winnipeg Free Press before coming to the NFB in March 1942. Hired as an assistant editor, Parker quickly showed a desire to make her own films. Grierson told her to go find some money. She met with staff from Health and Welfare Canada (known today as Health Canada), and submitted a proposal for a three-film project on the importance of vitamins for the nutrition of women and children. After going back and forth several times, staff at the ministry agreed to fund the project. Parker hired Judith Crawley as cinematographer, and directed three films that were eventually released under one title: Vitamins A, B1, C and D (1943). 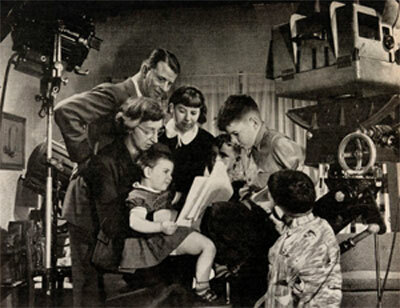 For her next project, Parker wrote, directed and edited Before They Are Six (1943), a documentary whose goal was to educate Canadian mothers about the labour market and about the possibility of placing their children in daycare. 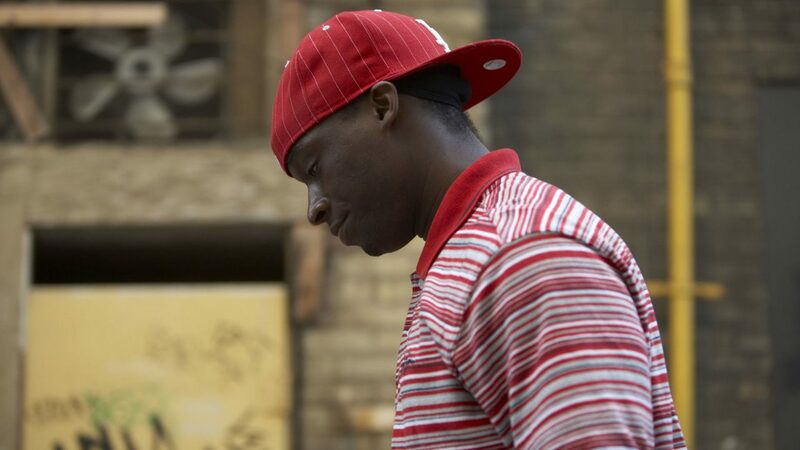 The film was decidedly ahead of its time, and revealed Parker’s humanistic filmmaking style. Between 1943 and 1956, Parker would go on to write, direct and produce more than 30 NFB films on her preferred subjects—music, culture, and children—including The Stratford Adventure (1954), for which she wrote the script, and which is one of her most notable works. Parker was named head of the NFB’s Education Film Unit in 1944, where she directed and produced films for provincial ministries of education. She left the Film Board in 1957, in order to devote herself to raising her children, but returned to film production in 1963 when she founded Parker Film Associates with her husband, filmmaker Morten Parker. The company was devoted to making films of a social nature. After an extraordinary career spanning more than 35 years, she turned to teaching film at Vanier College in Montreal. In 2006 Parker was named an Officer of the Order of Canada. Evelyn Spice Cherry was also hired as a permanent NFB employee. Born in Yorkton, Saskatchewan, she graduated in 1929 from the University of Missouri, with a degree in journalism, before going to work as a journalist for the Yorkton Enterprise and the Regina Leader-Post. In 1931, she went to London, England, to make an amateur film and wound up crossing paths with John Grierson. The future Commissioner of the NFB was impressed with her first film, and offered her a job at the General Post Office (GPO) Film Unit—the London-based government film production organization that he headed. The GPO Film Unit was the epicentre of British documentary filmmaking, and counted among its ranks the greatest documentarians of the day. It was here that Cherry would serve her apprenticeship in the art of documentary. While in London, she married Lawrence Cherry, who was also originally from Saskatchewan, and the couple returned to Canada before the outbreak of the Second World War. In 1941, she re-connected with Grierson, who was now at the NFB. He hired the Cherrys as a director-cinematographer team. Evelyn wrote, directed, edited and produced films, while Lawrence took care of the photography duties. Grierson would go on to entrust Evelyn Cherry with the Agriculture Film Unit—making her and Gudrun Bjerring Parker the only two women of the era to have achieved such high positions. Over the course of her nearly 10 years at the NFB, Cherry would produce and direct some 30 films. She was considered the creative force at the heart of many production teams, and her films demonstrate the British social documentary style that she learned while at the GPO. In 1951, she left the NFB to pursue an independent screenwriting career in Ottawa. During the early 1960s, Cherry returned to Saskatchewan and launched Cherry Film Productions Ltd with her husband. She continued to work as a producer and independent filmmaker until 1985. None of the women we have profiled so far made war propaganda films. That was an honour that—with Grierson’s consent—was reserved only for men. Jane Marsh was the only woman to succeed in breaking this unwritten rule. After joining the NFB in 1941, she quickly convinced Grierson to let her write a screenplay about a small town which, her research showed, exemplified the Canadian war effort. The project never came to fruition, but it did allow her to demonstrate her talent, and Grierson named her a writer and production assistant. Marsh quickly made her mark as a screenwriter. She developed a series of films on the role of women in wartime, but Grierson failed to give them the green light. She was, however, entrusted with directing a film on daily life in a family of French-Canadian farmers. Working with cinematographer Judith Crawley, she made Alexis Tremblay: Habitant (1943), which would become very successful and even screen at the Quebec Legislative Assembly (today the National Assembly). Soon after the release of Alexis Tremblay: Habitant, Grierson decided that there was starting to be a demand for films on the role of women during the war. He spoke to Marsh about it, and this gave her an opening to dust off her project for a series of films on the subject. Marsh wrote, directed and edited a series of three films: Women Are Warriors (1942), Proudly She Marches (1943) and Wings on Her Shoulder (1943). These firmly feminist films constitute a key moment in the history of women and film in Canada. They are the only war propaganda films directed by a woman, about women, and speaking directly to women. In effect, they were the first films “by, for and about women”, to quote a phrase dear to the heart of Studio D, the NFB’s feminist studio, created in 1974. Marsh brought an unprecedented level of creative energy and commitment to the propaganda film production team. Unfortunately, she resigned in 1944, citing deep philosophical differences with the NFB’s commissioner. In reality, Marsh’s resignation came about after Grierson refused to name her the producer of the Canada Carries On series – a position for which she was eminently qualified. Later, Grierson would admit that Marsh had good reason to resign, adding that he had never considered offering such a prestigious position to a woman. 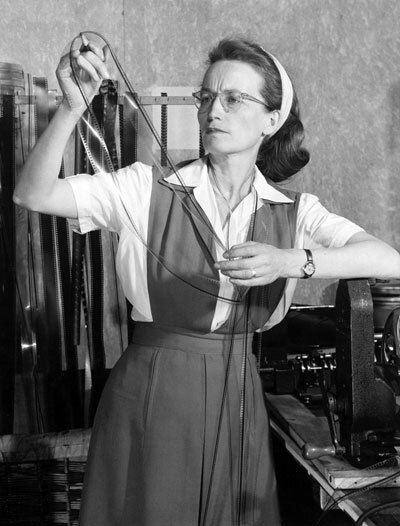 As we have seen, very few women succeeded in making documentary films at the NFB during the war. The same was true in animation, where Evelyn Lambart was the only woman of the era work in animation. Lambart was hired at the NFB in 1942, to create animated geographical maps, primarily for the series The World in Action. These maps served as an essential element in war propaganda films, illustrating the geopolitical issues they presented. Lambart became a close collaborator of Norman McLaren’s, and, between 1944 and 1965, co-directed several films with him—including the masterpiece Begone Dull Care (1949). Her role in McLaren’s oeuvre is absolutely crucial. In the mid-1960s, Lambart began directing her own films (typically using paper and linoleum cut-outs), many of which went on to win awards. 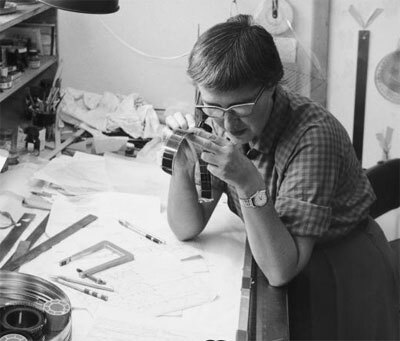 She was a true pioneer among Canadian women animators—for more than 20 years, she was the only woman to be making animated films at the NFB. 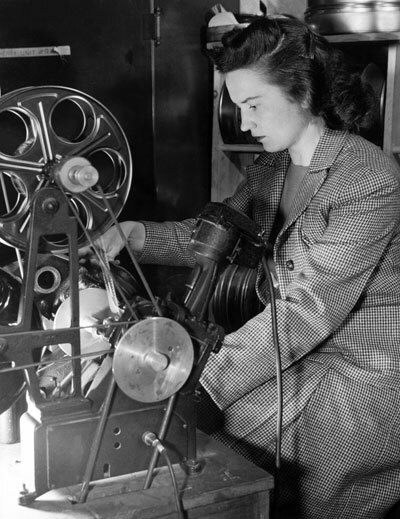 Women found opportunities to produce and make films during the war years. But the post-war period (1945-1949) would see the percentage of women in production teams decline significantly—as did the number of women across the NFB as a whole. Jane Marsh resigned in 1944. That same year, Judith Crawley’s name stopped appearing in NFB credits. The 1950s were no better. Evelyn Spice Cherry left in 1951. Gudrun Bjerring Parker followed in 1957. It would only be in the early 1970s—when Anne Claire Poirier’s series of films En tant que femme, and Kathleen Shannon’s Working Mothers would lead to the creation of Studio D – that Grierson’s “other half” of the creative force of the NFB would truly be unleashed.